Smith Rock Highline Gathering Guidelines – Slackline U.S. Heading to Smith Rock for the highline gathering this month? Take a look at the guidelines below to help local slackliners maintain their good relationship with the park. Thanks to Hayley Erica for writing this up and to Oregon Slackline Access and other local slackiners for their efforts. Hi all! Smith Rock Highline Gathering is one week away! September 9,10, and 11. Thanks to local slacker efforts, we have permission to leave lines up overnight for those specific days so we are back in action at Smith! Local highliners at Smith are having slight access issues we have been working hard to remedy over the past several months. In order to keep up good relations with Smith Rock management and staff we ask that, while you are having tons of fun, to please be conscious and considerate park users. 1. STAY ON TRAILS. Some highlines may be easier to access by cutting through vegetation instead of staying on a designated trail but please please please refrain from doing this. There are designated trails for a reason and the Park management has asked us not to trample sensative and unique vegetation. 2. NO POOPING ON TOP OF SMITH ROCK. Silly as it sounds, absolutely no pooping at the top of Smith Rock. There are bathrooms at the Bivy, at the information center, at the bottom of Misery Ridge, and one across the river at the bottom of Aggro and Cocaine Gully. Hike down and use them. No, you may not bury your poop as though you are in the back country. Smith Rock is not the back country, do not treat it as such. 3. OBEY QUIET HOURS. Quiet Hours at the Bivy are from 10 PM – 7 AM. Please be respectful of other park users. 5. OVERNIGHT CAMPING IN VEHICLES IS NOT PERMITTED. Do not sleep in your vehicle in the parking lot. It is not permitted pursuant to Oregon Laws. 7. BE RESPECTFUL OF OTHER PARK USERS. Smith Rock State Park is a major Oregon destination. It is used by rock climbers, hikers, bird watchers, mountain bikers, and many others. Please be courteous to these park users and do your best to help give slack liner’s a good reputation. This includes thinking before hooting and hollering and not knocking rocks off the cliff’s edge. Please do not thwart the many efforts and time locals have put in to keep up positive relations with the park. As always, brings your own gear and rig your own lines! This is a first come, first serve gathering, do not leave it to the locals to rig lines for you. Contribute! 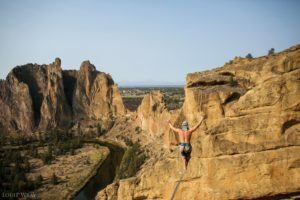 This entry was posted in Access Management, Community, News and tagged access, guidelines, highline festival, highline gathering, slackline, smith rock. Bookmark the permalink. Pingback: Slackline U.S. 2016 Summary | Slackline U.S.